The ViscoTec brand preeflow® got a new website. With a modern look and new features, there are also new information for visitors and customers of preeflow.com. For example, for the products and product data sheets more detailed data like recognizable distinctive features and spare parts lists are provided. 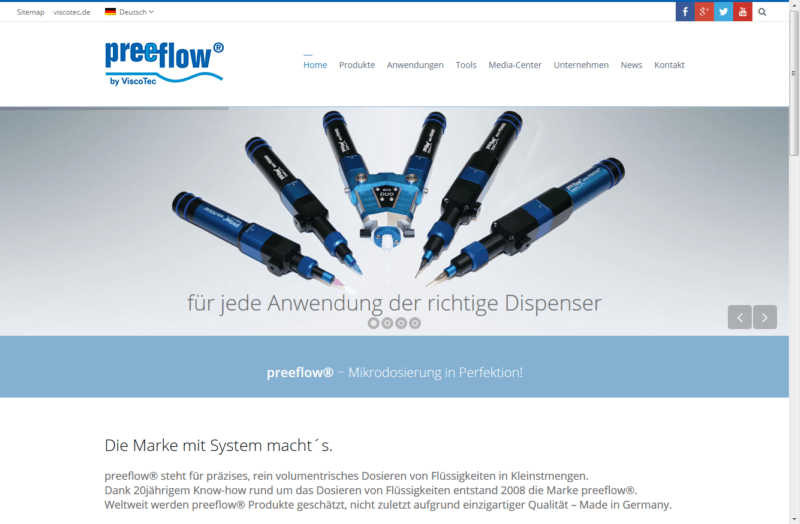 The preeflow® interested observer knows the areas of application already from the newly designed brochures, which are available for viewing in the download center in 13 languages. Also service tools such as a FAQ, and illustrated instructions for assembly and disassembly of dispensers are now available. Other tools such as a viscosity calculator will follow. The integration of preeflow® videos which can be viewed directly on the site, complete the new website.